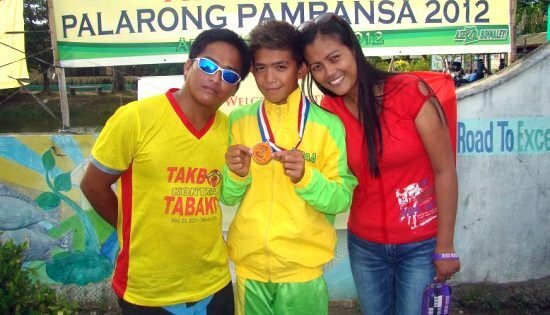 MAASIN CITY – Maasin swimmer Christian Ivan Salud is the sole player from Eastern visayas delegation who brought home 1 gold and 1 silver during the recently held Palarong Pambansa 2012 in Linggayen, Pangasinan. Salud, a student from the College of Maasin, bagged Gold medal in 50m breast stroke and another Silver medal in 100m breast stroke. His proud trainor and coach are Brian Morales and Jilma Maraon. Also behind Salud’s winning were local leaders headed by Mayor Maloney Samaco and school officials who did everything so Salud can get all the trainings for the event. Salud has been a consistent winner in Batang Pinoy, PRISAA, EVRAA, and other local swimming competitions. In the final tally, National Capitol Region (NCR) dominated the event, followed by Western Visayas and Southern Tagalog region. Eastern Visayas with only 1 gold thru Salud, 4 silver, and 4 bronze medals was ranked 17th. Palarong Pambansa is the biggest annual sports events for both elementary and high school students from private and public schools in the country conducted by the Department of Education (DepEd). QUEZON CITY – The pro-democracy Alliance for Nationalism and Democracy (ANAD) Partylist describe the torture charges filed by remnants of the infamous Morong 43 as one the many Maoist terrorists’ anti-government slicks even as it lauded the decision of the Capinpin 5, e.g. Eleanor Carandang, Jennylyn Pizarro, Cherylyn Tawagon, Valentino Paulino, and John Mark Barrientos to come out into the open to testify and belie charges of torture filed by about 6 erstwhile Morong 43 detainees against former President Gloria Macapagal-Arroyo and several military and police officers. At the same time, ANAD expressed deep and serious concern on the harm and violence that the Maoist terrorist CPP-NPA-NDF shall unleash against the families, relatives and friends of the Capinpin 5. It can be recalled that last Feb. 6, 2010, the military and police arrested the infamous Morong 43 in a house owned by Dr. Melecia Velmonte at E. De la Paz St., Sitio Mahangin, Brgy. Maybangkal, Morong, Rizal while undergoing bomb making and first-aid/medical training. “They (Morong 43) were released from detention after Justice Secretary Leila de Lima, upon PNoy’s instruction of Dec. 10, 2010, ordered DOJ prosecutor Claro Arellano to withdraw all the informations on the 4 counts of illegal possession of firearms and explosives and 2 counts of violation of the election gun ban filed against them; prompting Morong RTC Branch 78 Judge Gina Cenit-Escoto to issue the order in Dec. 17, 2010,” said Rep. Alcover adding that the executive action was made even as the Court of Appeals affirmed the validity of the search warrant issued by the Cavite RTC against them. “Reports from ANAD field chapters revealed that most of the released Morong 43 has since rejoined their NPA comrades in the mountains of Southern Tagalog, Bicol, and Central Luzon,” said Rep. Alcover. The Capinpin 5, in separate sworn statements and interviews with media, courageously revealed that contrary to claims that they were mere ‘health workers’ (SIC!!!! ), they were undergoing training as NPA medics and in explosives inside the house of Dr. Velmonte when arrested by government security personnel. The torture charges were filed by Drs. Merry Mia Clamor and Alexis Montes, Gary Liberal, Ma. Teresa Quinawayan, Mercy Castro, Reynaldo Macabenta, Jane Balleta, and Samson Castillo. However, the Capinpin 5 described Drs. Clamor and Montes; Liberal and Quinawayan as trainors and the rest as NPA active members in Southern Tagalog and Bicol. “Knowing Maoist terrorism by heart and the people running the organization, I am sure Jose Ma. Sison will do everything to force Carandang, Pizarro, Tawagon, Paulino, and Barrientos to cower and forego with their testimony,” said ANAD Rep. Jun Alcover as he pointed to the notoriety and violence of Maoist terrorism against humanity in his 10-years with the Maoist terrorist underground organization. “What worries us so much is the fact that the Maoist terrorist NPAs, upon orders of Joma Sison and Satur Ocampo, will leave no stone unturned to get back at the Capinpin 5, their families and/or friends. This is how the Godless ideology works! The indisputable fact is that - - the actions and statements of the Morong 43 (except the 5) were scripted and stage-managed by Maoist terrorist front organizations like Karapatan, Bagong Alyansa Makabayan (BAYAN), Alliance of Health Workers, Bayan Muna, Gabriela, Kabataan, Anakpawis, particularly Attys. Romeo Capulong, Edre Olalia, Juius Matibag, and Rachel Pastores solely intended to pit the security forces of the government, particularly the AFP and the PNP, against the Filipino people and other sectors of the community,” said Rep. Alcover. “PNoy must act decisively and with dispatch to protect the Capinpin 5, their respective families, relatives, and friends who are committed to tell the truth and the facts surrounding their arrests. In fact, government should be grateful to them (Capinpin 5) for doing a great service to our country’s peace, freedom and democracy by divulging the fallacies and lies spawned by the Godless Maoist terrorist’s CPP-NPA-NDF and their minions,” said Rep. Alcover. CAMP LUKBAN, Catbalogan, Samar – The 8th Infantry Division, Philippine Army formally activated the 8th Forward Support Medical Company (FSMC) on May 16, 2012 here at Headquarters Camp Lukban, Catbalogan City. According to BGen Gerardo T. Layug AFP, 8ID Commander, the activation of 8th FSMC will enhance the skills of 8ID medical personnel to become more effective, efficient and responsive health providers. The said Medical Company will be attached to the Service Support Battalion of the Division. The unit’s primary mission is to provide medical support to maneuver brigades and battalions, capable of treating patients with minor diseases and emergency medical treatment. They can also provide medical teams during disaster response operations and for other peace and development efforts in the area. As part of the activity, Captain Arturo A Llaso CHS (PA), the 8ID Command Chaplain officiated the blessing of two (2) newly acquired ambulance vehicles. The 8th FSMC will primarily utilize said vehicles for medical evacuations and disaster response operations. The enhancement of 8ID’s medical capability is in line with the Army Transformation Roadmap, which envisions a World-Class Army that our Nation can be proud of by 2028. QUEZON CITY – On the 18th month of the killing of ethno-botanist Leonard Co, his family appealed to friends and supporters to write the Department of Justice (DOJ) to come up with the resolution on the case soon. “I am thus appealing to all of you, to all those who have loved, known and honored Leonard for his contributions in the field of science, botany and taxonomy, and to all those who believe that justice must be served: Please help us urge the DOJ to release the resolution at the soonest time possible,” the letter, signed by Co’s widow, Glenda, stated. The panel of prosecutors formed by the DOJ led by Prosecutor George Yarte had already finished the preliminary hearings in the killing of Co in July 2011. “It is now May 2012 and the government prosecutors have yet to come up with a resolution,” Glenda said. According to Glenda, more than a year after Leonard was killed, various activities were held one after another to celebrate Co’s life as a scientist and botanist. “I and my daughter, Linnaea Marie, are very grateful for all the outpourings of love and respect you have given Leonard. Please give us the same strength as we call on the DOJ not to allow impunity to reign in the killing of Leonard and his companions,” said Glenda. The family’s public appeal urged everybody to write to the DOJ Secretary Leila de Lima, Undersecretary Francisco Baraan who is also chair of the DOJ special task force on extrajudicial killings and Prosecutor General Claro Arellano. “Let us flood them with snail mails, e-mails, phone calls and even SMS to remind them that we await the release of the resolution, and that we keep vigil on Leonard’s case,” the letter said. 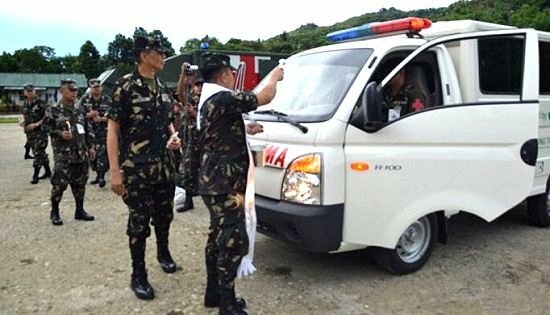 Co, along with forest guard Sofronio Cortez and farmer guide Julius Borromeo, were allegedly shot by soldiers of the 19th Infantry Batallion of the Philippine Army when they were conducting research on tree biodiversity for the Energy Development Corporation (EDC) in the Manawan-Kananga Watershed near the EDC geothermal plant in Kananga, Leyte. On that day, Co and four of his companions were surveying and collecting specimen seedlings of endangered trees for replanting. The criminal complaint, filed in January 2011, requested for a formal investigation on the killing, after a DOJ fact-finding panel cleared the military for responsibility on the incident. Meanwhile, human rights group Hustisya supported the call for the immediate release of the resolution. “This is the hardest part for victims of killings and human rights violations, the endless wait for the wheels of justice to roll. We urge the DOJ to come up with the resolution soon,” said Cristina Guevarra, Hustisya secretary general. QUEZON CITY – The Metropolitan Community Church of Quezon City (MCCQC) unleashes another sizzling summer of floral fashions in its third LGBT Flores De Mayo that is timed with the global observance of the International Day Against Homophobia and Transphobia (IDAHO) at the Barangay Pinyahan in this city that is considered the capitol of show business. This year, iconic gay actor and TV host John Lapuz lends his rising advocacy for lesbian, gay, bisexual and transgender (LGBT) to the annual Marian parade, a decision reached after what he felt was rising bullying from even the showbiz industry against the queer community. Lapuz comes in as the resplendent Reyna Elena, or Queen Helena, hoping to become a symbol of human rights crusaders against bullying of LGBT youth. Bemz Benedito, lead nominee of the Ladlad Partylist and who comes in as the Reyna Emperatriz (Queen Empress), explained that the Flores feast is raising awareness of the country around the issue of homophobic and transphobic bullying by celebrities, corporate media and the internet most especially young and adolescent LGBT. Other Reynas lined up to join are two reality TV transgender stars, former Pinoy Big Brother sister Rica Paras, and Survivor Philippines' Justine Ferrer. "Flores de Mayo is not just a fashion and beauty statement, it is a parade of our heartfelt issues. We want the people, most especially celebrities, to know they have the responsibility to stop bullying. That hurtful words, even if wrapped in religious prayer, still kill the blossoms of our emotions, our human rights as LGBT citizens," Benedito implored. Rev. Ceejay Agbayani, head pastor of the MCCQC, also said the Flores festivity is also raising trying to raise money for the benefit of the children with learning disabilities at the Payatas Elementary School. Agbayani is calling on generous sponsors to help the church get school and art supplies for some 50 children with Down sydrome and other disabilities before school opens in June. The LGBT Flores De Mayo is one of the many IDAHO events that sprung up this year to coincide with both serious and raucous LGBT festivals worldwide in a renewed campaign to end violence and discrimination against LGBTs. Despite its traditional style, the festival attracts even butch lesbians and closetted gay men who join as the consorts to the queens parading in gowns, a practice that is drawing the anger of the Roman Catholic bishops who want gays to desist from joining the parade. The first LGBT Flores De Mayo was launched in 2010 by MCC and ProGay with the call to push the Anti-discrimination Bill in Congress. QUINAPONDAN, Eastern Samar – The on-going investigation of the Department of Public Works and Highways (DPHW) Eastern Samar Engineering Office is looking on the possibility that overloaded trucks as the culprit on the collapse of Quinapondan bridge Tuesday dawn, May 9, this year. The damaged bridge caused inconvenience to the travelling public as the south coastal road of the province was closed down for around 15 hours. Traffic resumed at around 7:15pm, the same day, after DPWH personnel made immediate repairs on the bridge using steel plates as overpass. “Light vehicles were already allowed to pass through the bridge since evening of May 10,” said District Engineer Ricardo Odita. But huge trucks are still advised to use the Taft-Buray as alternate route. Quinapondan Bridge is undergoing repair and retrofitting on a contract with Ormoc-based Mac Builders. The project has been reported 40 percent finished as of last month. Citing accounts of local residents of Quinapondan town, around four 10-wheeler trucks passed by the town at around 3:30 in the morning seemingly on convoy going towards Leyte direction. Minutes after the trucks passed by, a huge sound was heard from the bridge according to eyewitnesses. “The trucks were filled with fine ground materials which looked to us as mines,” said a bystander who asked not to be named. Mining activities are going on in the municipalities of Salcedo, Guiuan and Gen. Macarthur. Reports had it that tons of mineral ores are being transported to either to Guiuan or Leyte for ship loading. According to construction workers who were sleeping on the bankhouse located right at the floor of the bridge said that they heard loud crack sounds while huge vehicles were passing the bridge. This prompted them to run out of the bridge and right after the last truck passed by, a portion of the bridge caved in. “We are not setting aside the possibility that huge trucks carrying heavy minerals as the ultimate cause of the collapse of the bridge,” Odita said. “We really are helpless in controlling the flow of traffic especially so that heavy vehicles usually pass by the bridge late night or early morning,” he continued. Aside from Quinapondan Bridge, DPWH is also monitoring the on-going repairs, retrofitting and strengthening of other bridges which include Taft Bridge, Can-avid Bridge and Dolores Bridge.